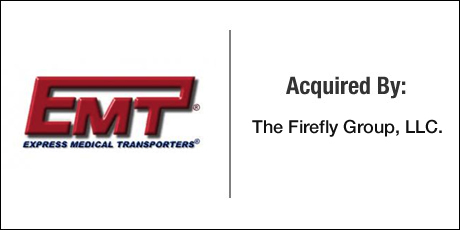 The Buyer: The Firefly Group, LLC. is led by Co-Managing Partners Mark Sneider and David Mann. The Firefly Group invests in growth-oriented, lower-middle market companies in the Midwest. The Seller: Express Medical Transporters® or “EMT®” (www.rideemt.com) is a nationally recognized provider of non-emergency medical and student transportation. EMT® has 10 locations across 7 states- with a goal of using transportation to enable people with special needs to live fuller, more active lives. EMT® offers ambulatory, para-lift and stretcher transportation services to city, county and federal agencies, hospitals, school districts, nursing homes, and other institutions with special-needs clientele. The Close: EMT® ownership responded to direct outreach by DVS in the hopes of creating a liquidity event. The Firefly Group saw an attractive market with solid growth opportunity, and in conjunction with DVS put together a win-win deal structure that included equity incentives for management to drive growth in the future.